“Grabe, ang saya. Hindi ko ineexpect na ganito pala karami ‘yung mga tao. It’s really an overwhelming feeling na nag-enjoy talaga sila,” she shared. The said concert was held at the Hard Rock Café in Makati, which was filled with screaming and ecstatic fans that night. “Sobrang kinabahan talaga ako nung una kasi naririnig ko po yung sigawan ng crowd, tapos siyempre hindi mo naman alam kung ano ‘yung mangyayari. Pero sabi ko kay Lord na siya na ‘yung bahala sa akin,” she said. Many viewers today could hardly recall the moment when Julie Anne first appeared on television when she joined Eat Bulaga’s Search for the Little Miss Philippines when she was only three years old, but a few could have missed her viral video on YouTube in which she sang an acoustic version of Nikki Minaj’s “Super Bass.” The video has already garnered more than 14 million views since it was uploaded less than a year ago. Julie Anne turned 18 yesterday, May 17, and just like any other debutante she had a long list of wishes for this year. Julie Anne decided to take a hiatus from school due to her hectic schedule recently. She plans, however, to resume studying this June. 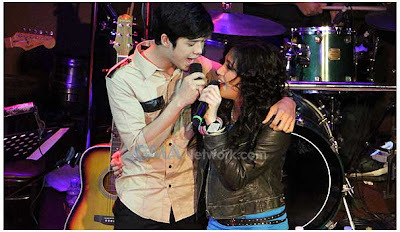 Even if she’s already eighteen, getting into a relationship is something that’s not yet in Julie Anne’s horizon. She said that she wants to focus first on her career and her studies anyway love can wait. She may not have a real-life boyfriend but Julie Anne is happy having at least a “reel-life” partner in the person of Elmo Magalona. Although to their throngs of fans the Julie Anne – Elmo Magalona or “JuliElmo” love team was a match made in heaven, actually, it had a serendipitous beginning. Julie Anne and Elmo Magalona are starring in an upcoming GMA Films’ offering “Just One Summer,” which is slated to hit theatres sometime in August. Julie Anne shared a glimpse of her character in the said movie.